We are now at the end of the Second Balkan War. Having recovered some of the previously lost territories, there was a new sense of optimism. For decades, the outskirts of Empire were whittled away, mostly by colonial Western powers – a dying empire. The end result of this most recent war was to turn the tide…if only momentarily. The Ottomans were determined to play both sides against the other in the fast-approaching war, delaying for an extended period any real commitment to one side or the other. Ultimately, there was only one choice that was likely. On the one hand, Britain, France and Russia; on the other, Germany. The Triple Entente was represented by the colonialists: France and Britain already making moves on Ottoman territories, Russia, the perennial foe, with an eye on the Straits and the Christian communities in Eastern Anatolia – bordering the Russian Caucasus Mountains. The Entente powers might talk nice in order to win the Ottomans to their cause, but their actions spoke louder than words. It was not helpful when the two state-of-the-art dreadnoughts – commissioned by the Ottomans, scheduled for delivery by the British shipbuilders Vickers and Armstrong in July 1914 – were requisitioned by the British shortly before the (ever-delayed) scheduled delivery. The day after the British decision, the Ottomans concluded a secret treaty of alliance with Germany, a nation with whom they already held a close relationship. While the Germans would be the strong friend that the Ottomans needed, the Muslims might prove to be the right ally for the Germans in their fight against the colonialist British and French – and the envious Russians. Once war would later break out, the Germans established a jihad bureau in Berlin, dedicated to producing pan-Islamic propaganda; they treated Muslim POWs (captured while fighting for colonial Britain) with respect toward their Islamic traditions, hoping to convince them to switch sides and fight for the German cause. The Germans had previously established a military mission to the Ottoman Empire at the end of 1913. Otto Liman von Sanders was nominated; he was appointed command over the forces that secured the Straits. To the Russians, this was tantamount to the Germans having control over the Straits – an intolerable situation. Two German ships, the heavy battleship Goeben and the light cruiser Breslau, were brought into the Straits – this in order to protect them from the more capable ships of Britain and France. The Ottomans demanded significant concessions from the Germans in order to allow this escape; the Germans had little choice but to agree. The ships were to be flown under Ottoman flag, in some manner replacing the two ships confiscated by the British. Consider the accomplishments by the so-called sick man of Europe: they secured an alliance with a powerful European power in order to protect their territory from Russian aggression; they had mobilized their armed forces; they acquired modern warships. They did all this without having to get entangled in any actual war-fighting! But war did break out: North Africa lost; Mesopotamia occupied. The Russians made advances through the Caucasus and into eastern Anatolia, with the Ottoman forces being routed in the initial conflicts; the British attacked at Gallipoli, where the defenses – directed by the Germans – held. 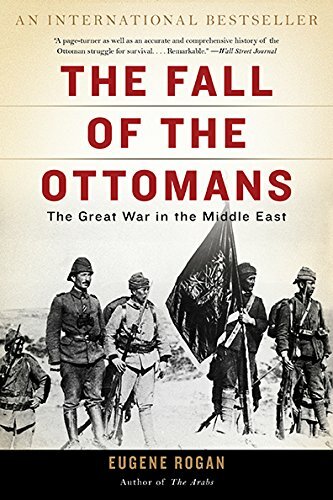 There were times on both fronts where the end of Ottoman rule seemed inevitable. What does this have to do with genocide? The Christian Armenian minority in Turkey numbered something approaching 2 million at the start of the Great War. By the end of the war, the number could be counted in the tens-of-thousands. The vast majority were killed or forced out in mass-migration. I have written about this genocide three years ago – at the time of the 100th anniversary commemoration. I based my post on a chapter from Rogan’s book – a book that only now I am returning to. I took advantage of the commemoration to skip ahead in the book…after which it remained on my shelf for too long. For those who believe “diversity” is marvelous or that open borders for people with vastly different cultural values and traditions is the path to peace and liberty, consider living in a place – especially a dying empire – where you are the minority. Consider what happens when the inevitable scapegoating begins. There are too many examples in history that demonstrate the disaster for those who find themselves in this situation. What happened to the Armenians (and other Christian populations in the region) is just one example.